Last year’s hike on the Grand Enchantment Trail was one of our most rewarding hikes. A challenge in terrain, navigation and water management, we felt a sense of pride in the completion of that route. We figured we’d give ourselves a couple years before returning to a ‘route’ type trail, but memories are short and romantic, so we are headed out for what we believe to be a similar type of adventure this spring. 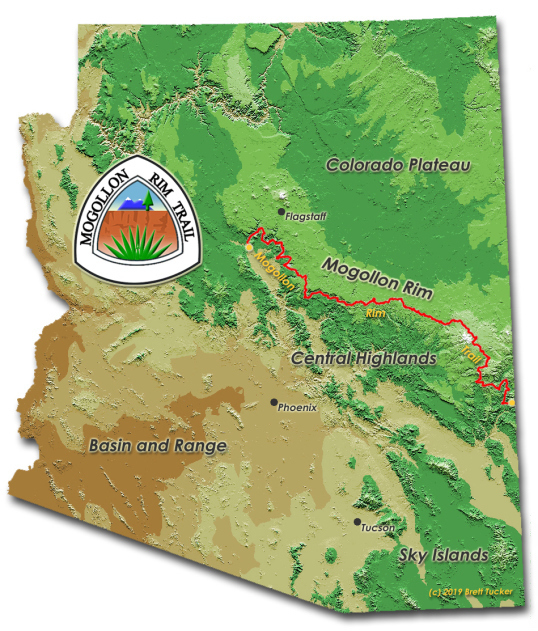 So…next week we head out on the Mogollon Rim Trail! The Mogollon Rim Trail is a creation of Brett ‘Blisterfree’ Tucker. He and his partner, Treehugger, have researched, scouted, put foot to ground on the route and created maps and guidebook information for the route. We are very excited to be among the first dozen footprints on this route. The MRT has had 3 other thru hikers to-date, and only one journal (Dirtmonger’s) that has a recap of the thru-hike experience. 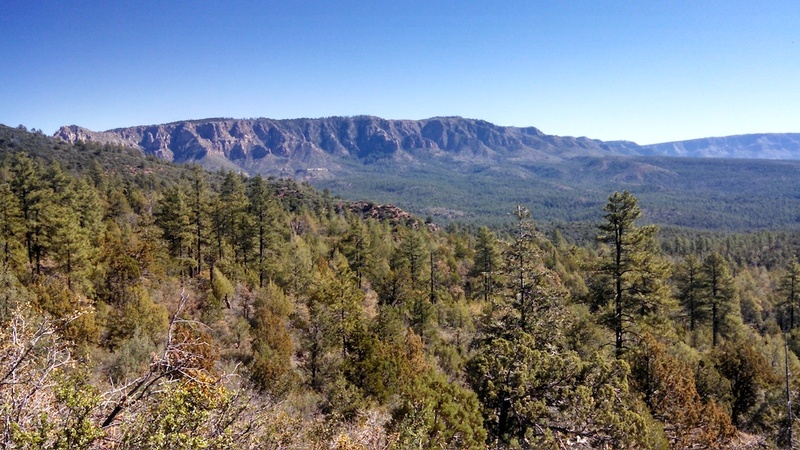 Click here to read Brett’s full description of the Mogollon Rim Trail. On our hike of the Arizona Trail in 2015, we encountered the Mogollon Rim Trail just north of Pine, Arizona. Aptly named, Pine was the beginning of more tree covered walking as well as colder temps on the AZT hike. We expect a mix of both open and tree covered walking throughout the MRT. What is the Mogollon Rim? The Mogollon Rim is a prominent escarpment that rises out of the desert southwest creating the southwestern edge of the Colorado Plateau. The Rim has dramatic canyons cutting into it, created by plate tectonic forces and erosion from water, ice and snow. Official Length & Elevation: The trail, beginning in Cottonwood, Arizona and ending at the Arizona/New Mexico state line just west of Alma, NM, is roughly 480-500 miles long. The lowest point on the trail nears 3300’ and the on-trail (non-alternate) high point is over 9500’ in elevation. We will begin our hike in Cottonwood and, time permitting, extend beyond the AZ/NM Stateline to Gila Hot Springs, some 60 miles beyond the official eastern terminus of the MRT. This will make our hike roughly 550 miles long. The extension will take us through a section that we enjoyed while hiking the Grand Enchantment Trail in 2018. Since the MRT is a route, and not a straight-up trail, we anticipate spending time navigating, route finding, working around obstacles in canyons and washes, as well as sorting out stream/river crossings that may be challenging with the heavy precipitation that the southwestern US has received this past spring/winter. Because of this, we are planning for daily miles to be on the low side of our typical averages. Hey FB! Hope you are doing well man! What are you hiking this season? If all goes according to plan, we will be hiking a form of the WASU (from St. George to Moab) in May, then the PNT in July/August. Should be a good summer! I was part of a horseback group that did that whole route in 1980 from Flagstaff. This was a part of our trip from Darby, Montana to Mexico. It was before the fire that devastated the west end and the forest was ancient and beautiful back then. Also there were wild horse herds that came up from the reservation for the summers and ranged all over the rim with wild stallions fighting for mares near an old fishery. The fishery was near an old lookout tower. One night a stallion tried to steal our horses from the picket line. Exciting times. There are still descendants of those horses on the Rim, when you see poop piles, that is stallions marking their territory. Have a great journey. Sounds like quite a trip Farwalker! Looking forward to seeing some of those horses! The rim actually comprises the southWESTern edge of the Colorado Plateau. I suppose it could be argued that it comprises the southwestern and southern edge, but southeastern? I wouldn’t say so. You are right, Tao. Correcting the typo.